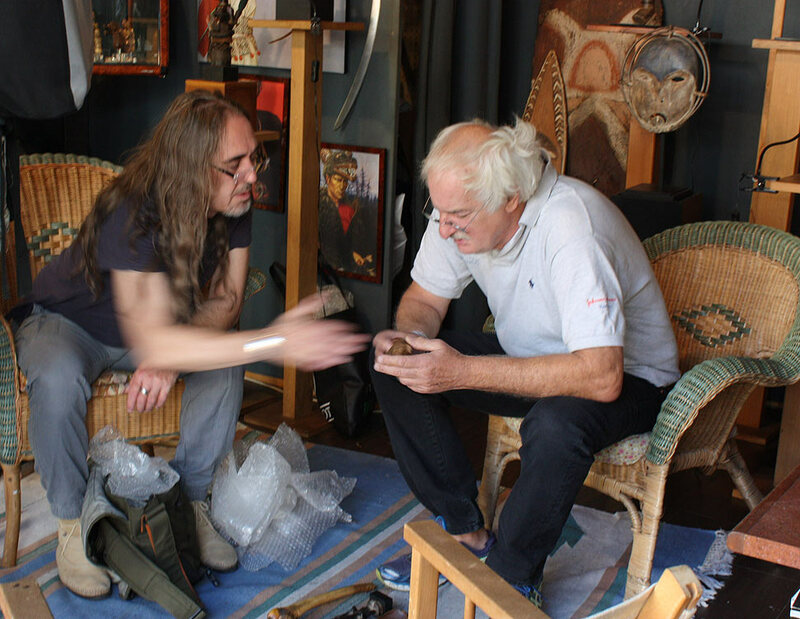 Denis in his flea market shop Saturday morning being shown pieces by a seller. Denis Ghiglia is the man behind the curtain. 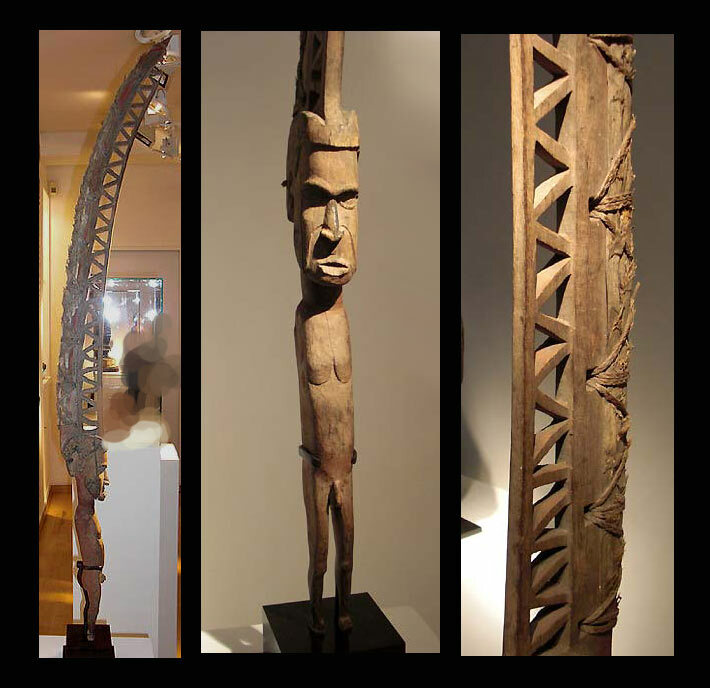 If you collect Oceanic or Native American Art, there is a good chance that one of the pieces in your collection was originally sourced by Denis Ghiglia! 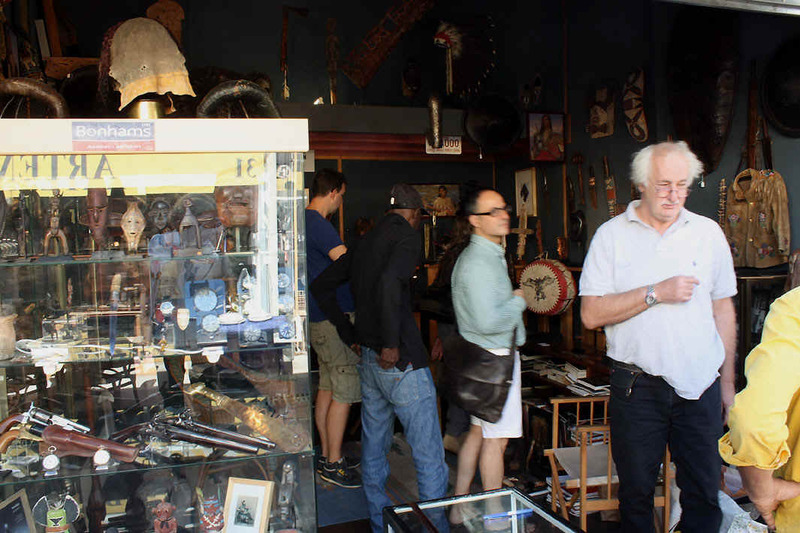 Among dealers, he is seldom mentioned and certainly never to their collectors. Denis he is one of the most known and active pickers in Paris, the Saint Germain Des Prey Art District and the famous Paris Flea Market. 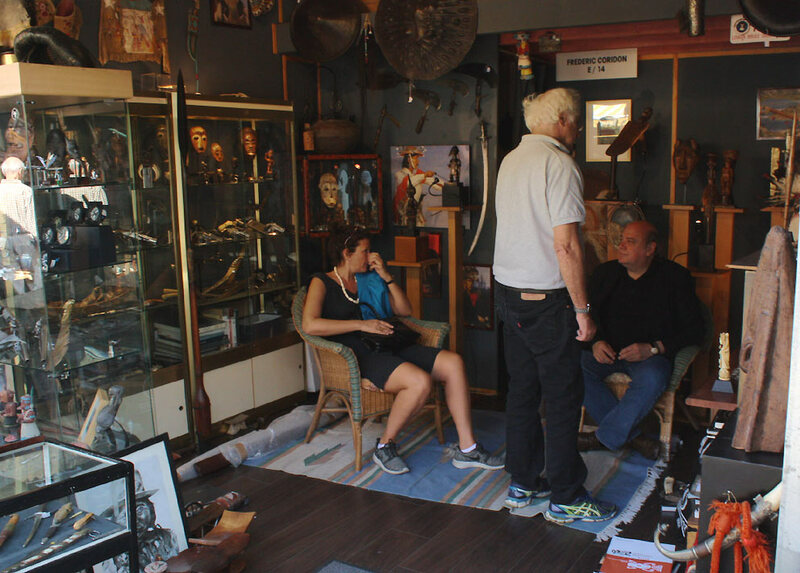 Denis is a naturally gifted dealer who has the pursuit of treasures in his blood. In fact he's probably in prime form at 70 years old. He has been supplying many of the biggest name dealers in the Tribal Art field for nearly 30 years. 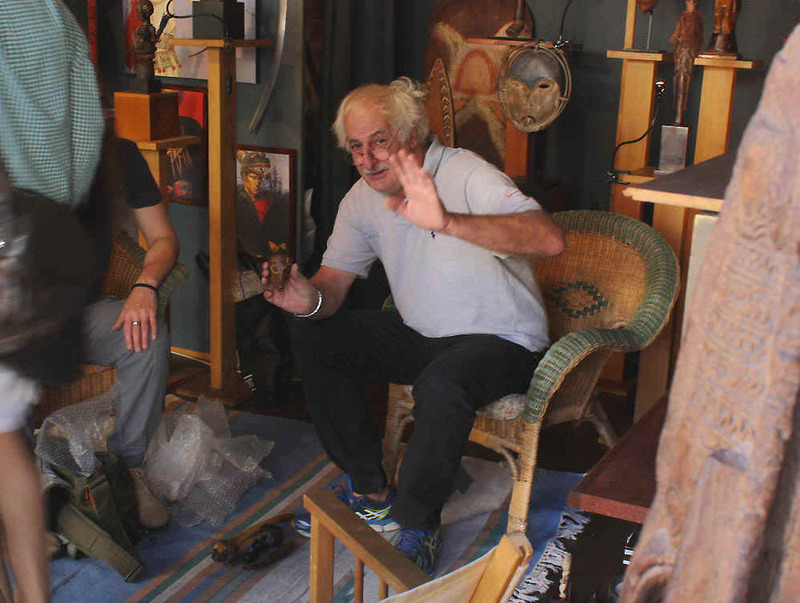 During this interview in his flea market booth, he constantly had private sellers visiting and offering him pieces for sale. He seeks no fame or publicity but we feel his rich journey and contribution to the field is worth sharing and recognizing. Interviewing him was much like boarding a crowded moving train and trying to find a quiet corner. Once I was in his domain, there were numerous and frequent distractions to work with as anticipated. TM: How long have you been selling at the Paris Flea Market? Ghiglia: Well I've been dealing for 45 years since 1971 but have been in this market for 25 years. I started selling Native American and shortly after met some very important people in England who were selling African and South Seas and from there I just learned and learned. TM: Are you a self-taught dealer or did you have a mentor? Ghiglia: No, totally alone, I learned by myself. I had luck in my life though. A long time ago I met some people in London who trusted me. They said, okay you have a market in France, so we'll consign you the stuff and give you terms. Every month I would fill my car up with good stuff, Maori stuff- everything you can image! Thirty years ago in England the Portobello market was a fantastic buyer's market with South Seas clubs everywhere. Because they were a commonwealth, there was such great material then with swords, pistols and Polynesian. All these guys, military people, came back on ships with things from Australia, New Zealand, Hawaii everywhere. Many of those pieces were in the countryside and have slowly disappeared because people want them. TM: Is your passion primitive art and weapons? Ghiglia: Primitive art principally. I can not collect the best pieces for myself. My specialty is North America, the Northwest Coast and the Southwest. 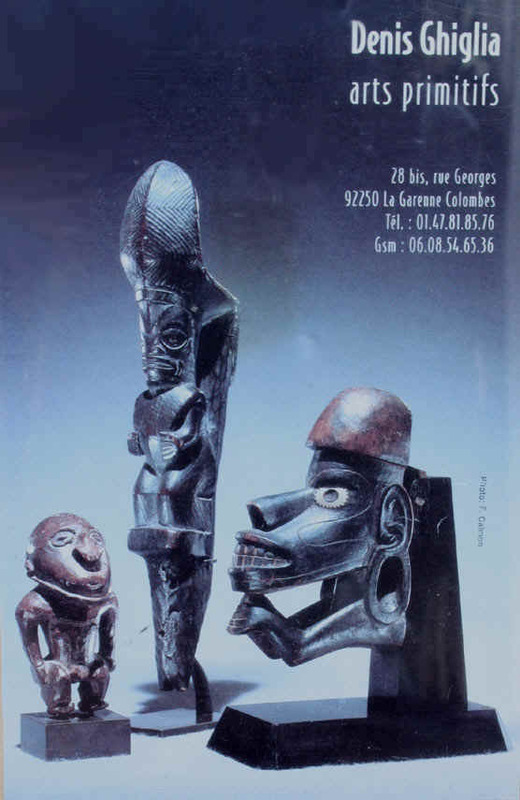 I keep the best African and Oceanic pieces for my customers, which are many French dealers who are very important collectors. For me, selling medium quality pieces keeps me busy and makes the difference. TM: Do you collect anything yourself or do you just enjoy turning deals? 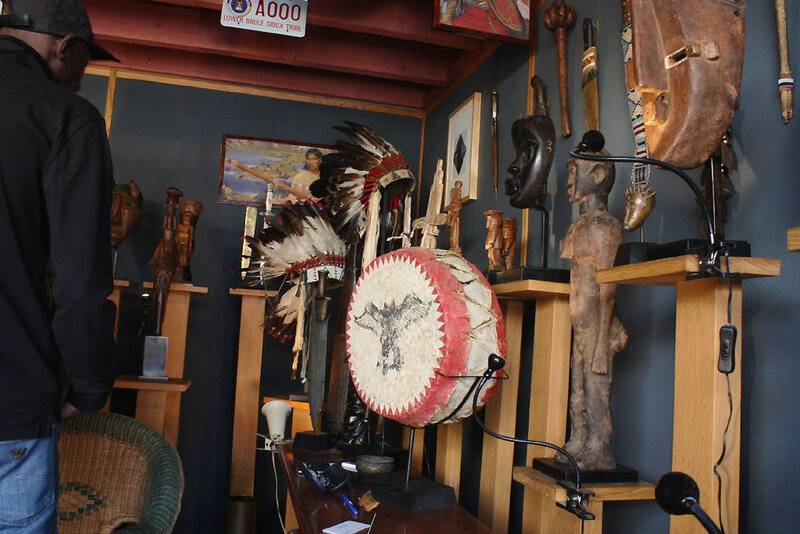 Ghiglia: At my house, I have an important collection of American Indian. TM: What is the key to success at the Flea Market, is it being here all the time, having a consistent presence? Ghiglia: For starters, this is the biggest flea market in the world because there are more than 2000 dealers here. The market is historical and started in the mid 19th century for the rubber trade. Most of the important dealers like Andre Breton, Charles Ratton, and Picasso used to come here every weekend to find things. 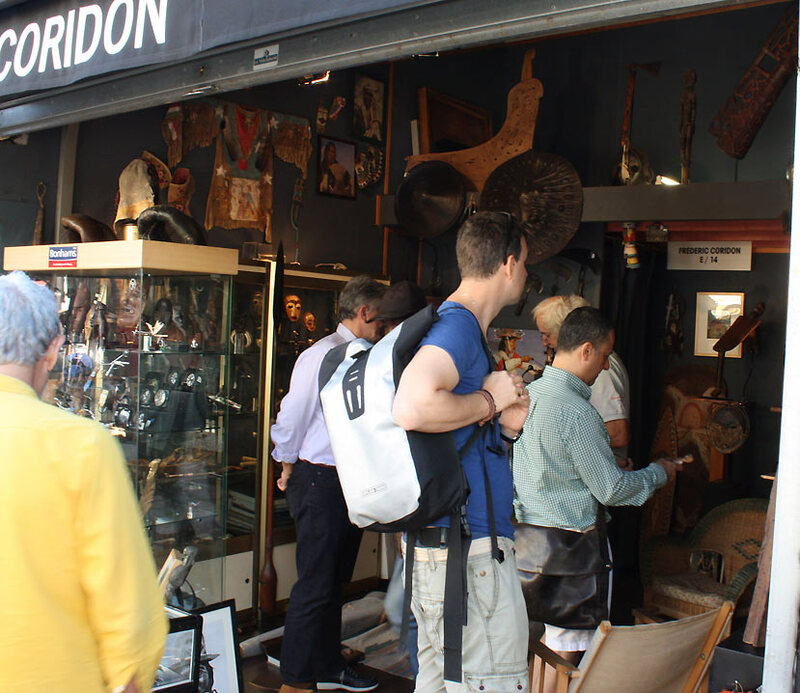 Twenty and 30 years ago there was a lot of great material here, provenanced material and many dealers. Now I'm one of the only left and people bring me material which is great. Denis examining pieces offered to him. TM: You've been in the business long enough to see how the market has changed? Your thoughts on that? Ghiglia: I mean, the really good pieces are very very difficult to find. You can find important pieces at galleries but always for a BIG price. If you're running like me, I find 5 or 6 great pieces in a year I'm very happy and consider myself lucky. Some dealers travel all over Europe and do the same. People bring me good things to this shop all the time. They are medium quality that I make a living on. TM: Can you imagine doing anything else for a living? Is this a business you retire from? Ghiglia: No! If you retire you die. I tired to retire at 62 and now I'm 70 and still working. If you retire you'll have American style health problems. Denis in his element. His shop again full of visitors. TM: Thinking back, what was the best year you've had? Ghiglia: It is difficult to say but it was around 2005 about 10 years ago. It is still possible it can come again because this business is like a "wheel". All these collectors that are at the end of their life with great collections, the art is coming back on the market. For example, I'm going to see the biggest collection of Oceanic stuff, the guy is nearly close to dying. So the thing is always turning, always retuning. You see these big auctions at Sotheby's and Christies, all these dead people, and their collections circulate or go to their children and they sell it. 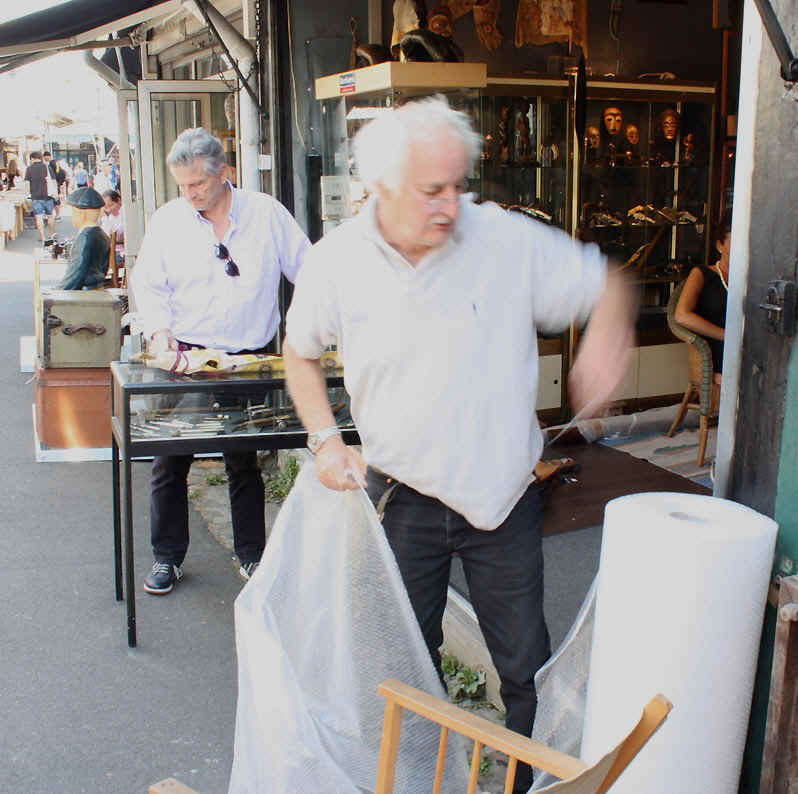 TM: What are the most memorable pieces discovered in the Flea Market in the last 10 years. 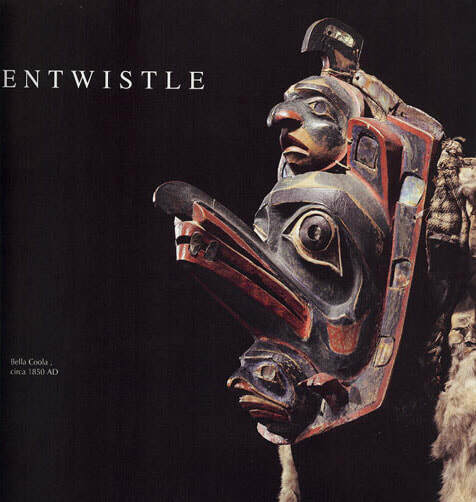 Ghiglia: For me the most important pieces at this market was a Northwest Coast Frontlet mask with ermine pelts which I sold to the Cincinnati Museum. Well, I consigned it to Lance Entwistle and he sold it to the museum. It turned up at the flea market. There was also a fine Fang Figure from Helena Rubinstein which I sold to New York. There was also an Easter Island dance paddle which I sold to Anthony Meyer. TM: What keeps you inspired getting out of bed in the morning and turning deals? Ghiglia: Because the pleasure to buy is much greater than to sell. To discover good things at a fair price, hopefully unknown, is what gets me up in the morning. People know me so sometimes I'm lucky. I like buying more than selling. I keep my shop so I can buy, but if I have great material, it does NOT stay in the shop, it goes to the dealers I've mentioned who always buy. TM: So, the thrill of the hunt has never left you? Ghiglia: Never... never. I'm too busy to get depressed also. But there is competition though, there are guys in Belgium running everywhere. If you have the strength to do it and the capacity to get the money, well... The access to pieces is the most important thing. TM: What was the first category of objects you started selling early on and was there a learning curve? Ghiglia: Japanese swords and military weapons. After the war and the Japanese surrendered, all these swords and weapons went to the United States. All the GI's came back with souvenirs and swords since the Japanese were put in jail if they tried to keep them. Some of the swords sold for just $200-300 and some were extremely rare and sold for $25,000-$30,000. There was a big hunt these swords in the States and I was at many of the Flea Markets in the 1970's looking for them. Some great swords were sold because the GI's didn't know the value. If they sold one for $2000 they were very happy. But you had to be a real specialist and it was very difficult. Very specific knowledge of markings and signatures was required to be successful. These collectors came in to buy a sword. Denis at work packing up a purchase. Noted oceanic collector Thierry Mackie helping in the background. TM: You know virtually everyone. I'm curious if it is hard to stay on good terms with all the dealers, collectors and personalities? Ghiglia: Many dealers are jealous of each other. I work with an Important Hawaiian dealer and he is very angry against some of the people who do the same job as him because there is competition. My favorite clients love me. I have some private collectors, I won't say the names, but I have a few important collectors. But, many galleries I don't want to work with and it is not possible. TM: What would you say is the easiest material to sell in Paris? Ghiglia: I would say that would be quality objects. It can be African, Oceanic or American Indian. It really doesn't matter if the quality is there. TM: Given what you do and how a great piece can turn up an any moment, how much cash/ euros on hand is it necessary to have at all times? Ghiglia: At least 10,000. However, when an important object turns up, I will try to get it on consignment first or do half cash and half trade with the inventory I have in the shop. TM: Do some of the Paris dealers owe their success to you? TM: What were your best years in Flea Market in terms of volume and quality coming through? Ghiglia: Like my friend in London says, we are the Dinosaurs in this market! I say this because good stuff totally disappears. More and more people have the knowledge about quality; with the internet and ebay, it makes it very difficult to find things. Twenty or Twenty Five years ago you could find Polynesian and everything. In today's market, the big problem is that it is managed by the big auctions like Sotheby's and Christies. They get control of the big collections, they get money from the buyer and seller, and they can guarantee a price. So, for the dealer it is a matter of impractical odds. TM: Speaking of the auction houses, how often have you seen a piece that you've sold, rise to the top or go to a top dealer? Ghiglia: Oh yes, it happens. But they don't like to get pieces from dealers, since they think the pieces have been shown. For example, I bought a club from you and it sold for a BIG price at Christies. If I came to them with the club they would not take it. So, the club went through my friend, a private guy. They are always scared to get stuff from dealers, fearing it has been seen, so it is difficult. If you're courageous enough to put a piece away and don't show it to nobody, which is totally impossible with me, then you can put it in an auction. No problem, Of course! But, if you have very good clients like "...... ....., .... .........", sometimes it is best to offer it to them and get the money quick. With the auctions, you can have like 30 percent commissions, the expertise, the photo charges... you know the job. You get paid months after the piece sells and they have the piece for months before it sells. TM: Do you ever buy at auction? Ghiglia: Yes, sometimes. I found a good piece at Drouot and nobody knew what it was. It was at a morning sale when nobody was there. I got it cheap and it turned out to be a rare Hermit Island God figure. I sold it very quickly and it went through like five dealers in one week! Seriously. Rare Hermit Island God Figure, Ex. Hotel Drouot sale. TM: Do you think the average person would be surprised to know the volume of material you turn over in a year? Ghiglia: Yes absolutely. Officially like 1000-1100 pieces per year, but unofficially probably more. TM: Do you recall any wild and crazy stories about chasing an object or discovering one? Ghiglia: Yes, sometimes I'll just be sitting in the shop and someone will come in with a masterpiece. One of my favorite stories happened a couple years ago. A guy knew I was specializing in American Indian and he had the best Cradle board in the world. 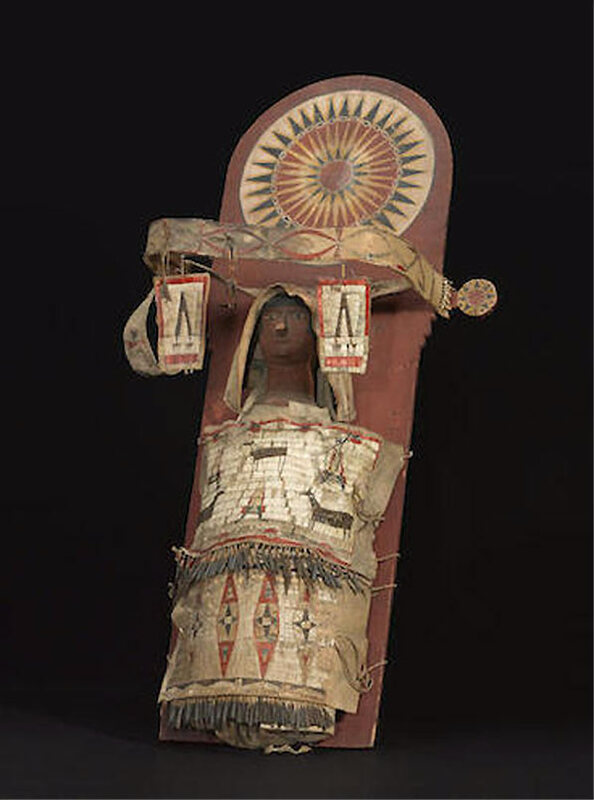 It was a Sioux quilled cradle board with doll dating to the 1820s. The guy came about 10 o'clock in the morning, he was like 45-50 yrs old... I said, where did you find that??? He said, "I went to a small home sale in the country and found it". I said, do you want to sell it? He got upset and said, "no no, I want to trade it". I said what do you want? He said, "I want an African mask"! I said, look around I have a number of them here. He said, "you're very nice BUT there is a better one I like with Lucas Ratton that is 3000 euros". Luca also had a shop in the market at that time. I said, NO PROBLEM and we went to his shop with him and got it. I made it work and we both got what we wanted. I consigned it to Bonhams in San Francisco. There are five known in the world. There is one in the Pitt Rivers Museum and one in New York. TM: Is there any material that you won't buy or sell? Anything that is Taboo or off limits? TM: Do you ever make mistakes and lose money when purchasing? Ghiglia: Yes, sometimes I lose money. I prefer to lose money on pieces I make a mistake on, taking part of the money and keep playing the game. The mistake is done. It doesn't matter if I lose 1000 or 2000 dollars, I turn the money on other pieces. I'm always looking forward. Like this morning, you see people come bringing stuff, buying, trading things; its always in motion. I made an invention with business. I think I'm one of the few dealers in France to do this, but I always buy with a little bit of trade and a bit of money, so it doesn't cost so much. For example, if a guy brings me a piece for $10,000 usd and I don't want to pay his price, I'll give him $5000 and the rest in trade and the guy is happy. Always people get money with me and a bit of trade and I get rid of pieces I have a problem to sell. I see very few dealers do this and it is important because when you have runners, my suppliers, they always need money because they have expenses like airline tickets, trains and cars. They have to make a living. A guy like ".... .....", he comes from Los Angeles, I buy two pieces from him, I give him back a Makonde and some money and he is happy. I have good things here. TM: You interact with so many people. Do you ever have trouble telling them "No"? Ghiglia: No, its just business. I have great experiences. If I have to think about a piece too long its no good. 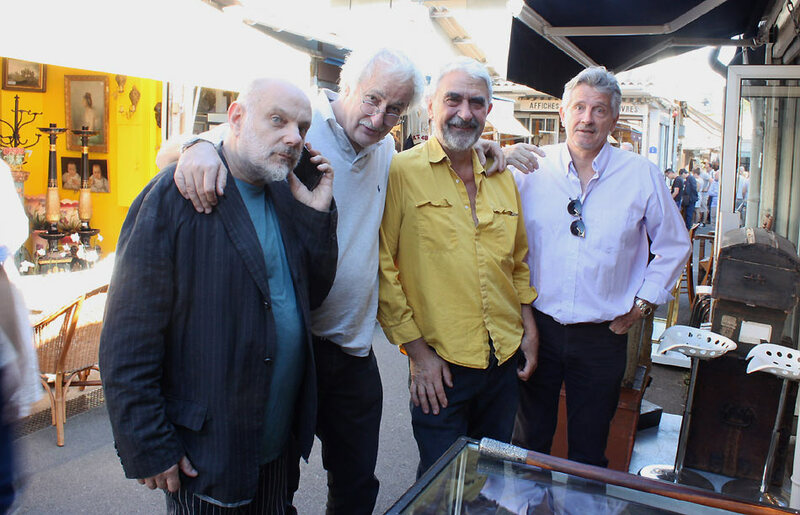 Denis (second left) posing for a photo with the gang. That's a wrap. A special thank you to Denis for a great lunch, his generous time and insightful thoughts!